Hope everyone had a safe and happy Halloween. We did!!! 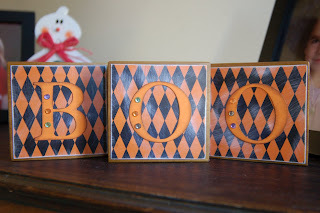 First I had to show you my one and only Halloween craft project. I have seen these on blogs and thought I can do that. So I went rummaging through Kevin's wood pile and found some scrap wood to use. My sweet husband cut, sanded and stained the wood for me. Then I added all the embellishments. I love them!! Here are my sweet girls!! 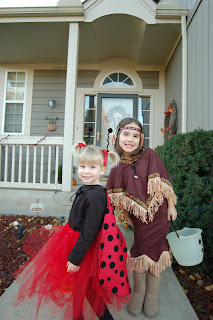 As you can tell Aundrea was an American Indian named Princess Wildflower and Cassie was a Ladybug Princess. Don't you think they are just the cutest kids in the world?!!! NO, I'm not bias. Yes, that is my handy work. I made the wings and skirt. I saw the fabric at Hobby Lobby and thought of a ladybug. 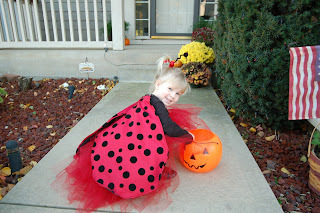 I asked Cassie if she wanted to be a ladybug and she said Yes. I could not wait to make it. 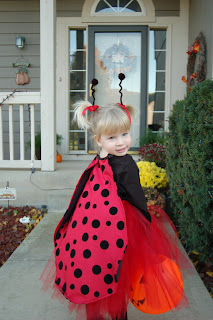 Then one day she says she wants to be a Princess so I said How about a Ladybug Princess. She agreed. I think the costume turned out stinkin' cute!! 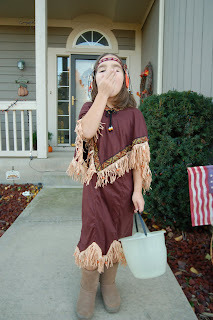 Here is Aundrea doing her Indian dance. 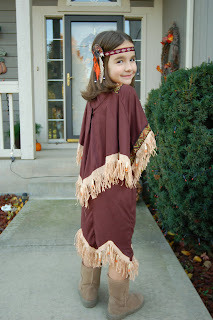 I was going to make her costume too but time got away from me and we were getting ready to go to West Virginia and I just didn't have time to do a good job so I bought this one in the stores. Aundrea was fine with that and she loved her costume. She makes the best Indian with her dark hair, eyes and skin tone. So cute!!!! Here they are before trick-or-treating. Aundrea was helping Cassie take flight. We had great weather. It was a little chilly but the girls had a blast. A couple of times I had to remind Cassie to say Thank you. One time I said to Cassie "What do you say (after getting candy)"? Cassie said "What did I get"? Yeah, finding out what candy you get in so much more important than your manners. What was I thinking? Hope you enjoyed seeing the pics. Thanks for stopping by. Leave a comment. I love to know you were here. Aw...the girls look so adorable. I am sure they had a blast. these girls are the most wonderful little halloween get up i have seen. mom melissa done a lovely job dressing the girls. aundrea, cassie, you girls are tops.love you all paw paw perry. I am so glad to see an update to your blog!!!! I love the little blocks. They are so cute. You are always so creative. The girls look so cute and it looks like they had a fabulous time. What kid doesn't like Halloween for getting to dress up and be given candy! The girls looked great. 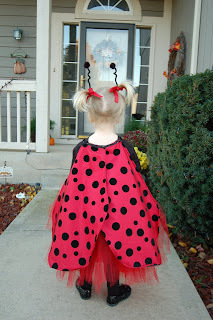 I love Cassie's ladybug outfit. So clever! You're right. Aundrea makes a very lovely Indian princess. Maybe a little of her great-great-great grandmother is showing! The wooden blocks are darling. Are you thinking ahead to Christmas? We love you all. outfits. Can't wait to get to Kansas this weekend. 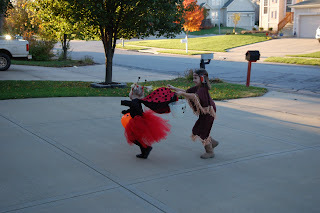 such a cute indian princess and a lady bug. We love you all and see you sat.